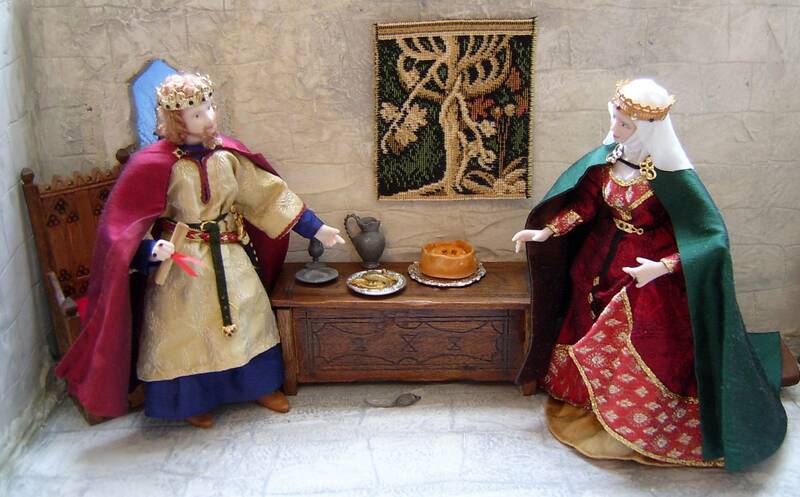 Magna Carta, Lampreys and a Child Bride. THE MAKING OF KING JOHN. 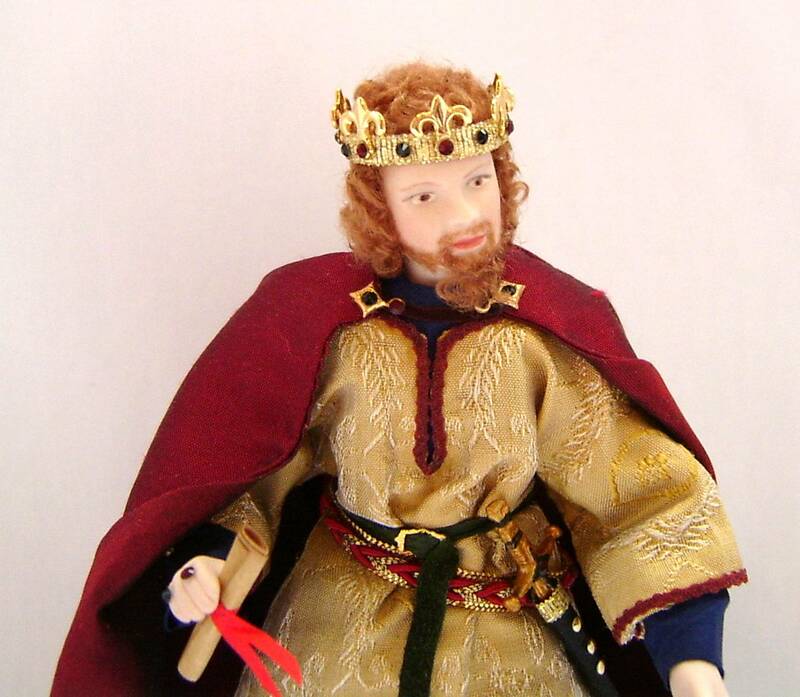 With the 8ooth anniversary of the signing of Magna Carta this month (June 2015) it was only natural that I would be drawn to creating a King John miniature doll. 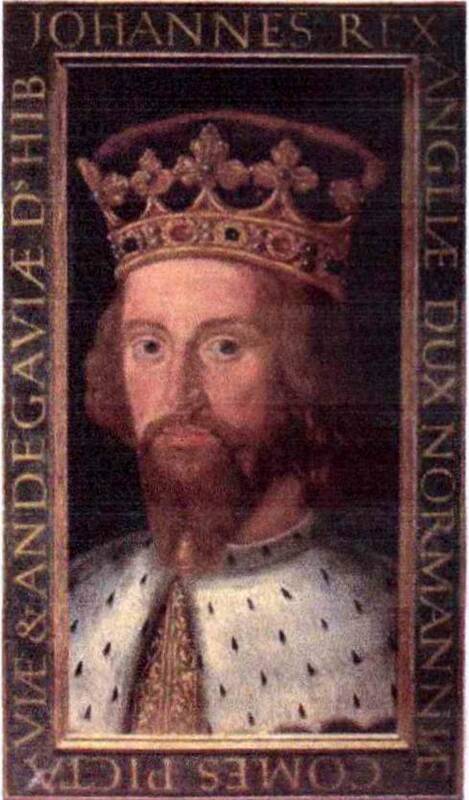 I have to admit that I didn’t really know much about this king, only that he was the brother of King Richard 1st (The Lion Heart), wasn’t very popular with his people because of the high taxes he levied on them and was part of the legend of Robin Hood. I didn’t even know he was the son of Queen Eleanor of Aquitaine. 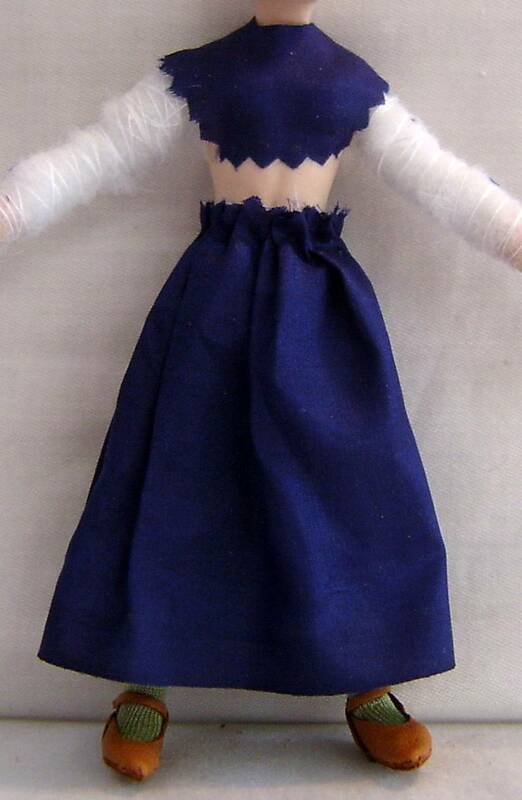 So, in order to make a doll of him I started where I always start best….. I looked in my costume books for an idea of what he might have been wearing in 1215. 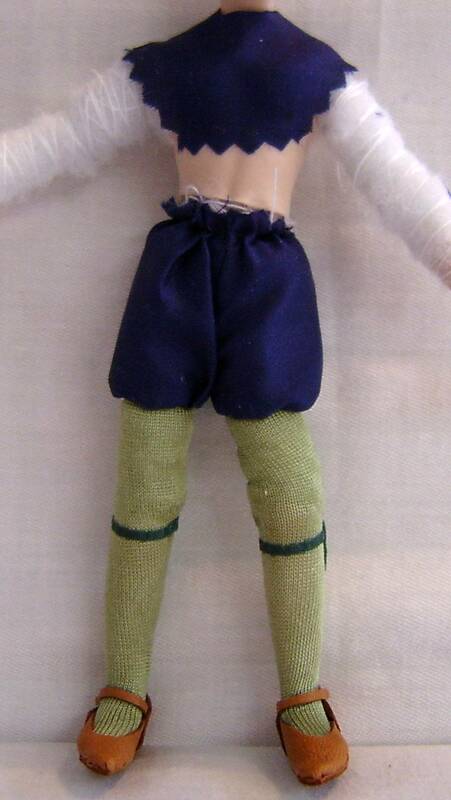 Next I needed to know which doll would be best to use and so I found the picture of his tomb effigy. These were often a very good likeness of the person concerned. 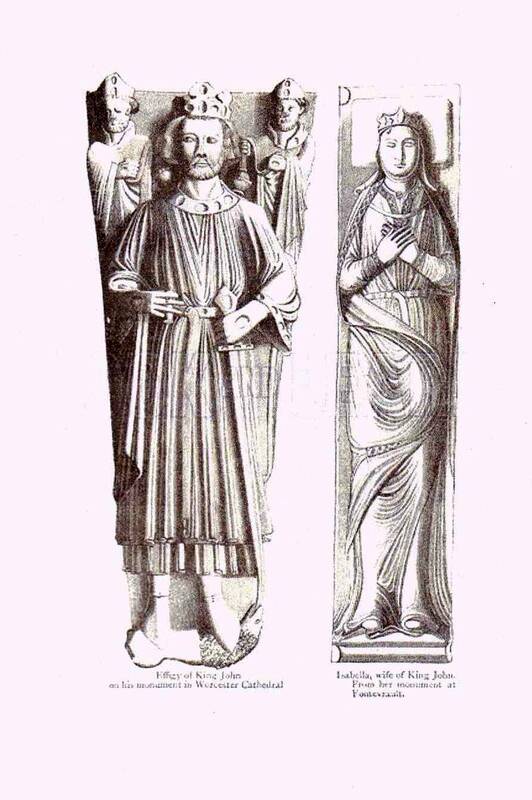 King John’s tomb at Worcester Catherdral and Queen Isabella’s tomb at Fonterault. Choosing fabrics was the next step so a quick check in the costume books again and away I went for a good rummage in my material stash (no mean feat!). 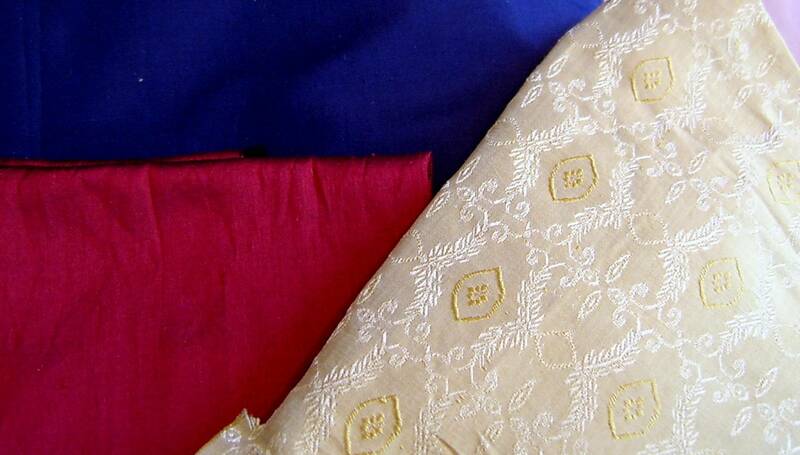 Fabrics chosen for King John. I don’t often get a chance to work on these early Medieval costumes so I was actually very excited. I particularly like Medieval costume although ALL costume is a joy to me. 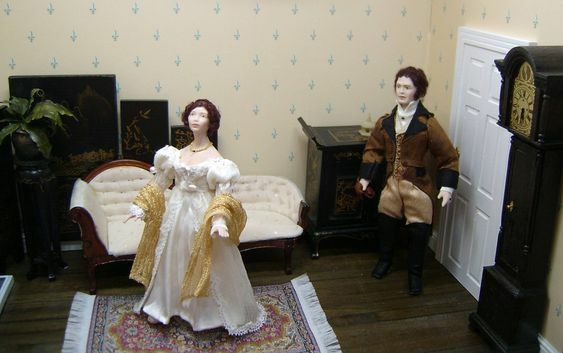 With miniature dolls, one has to give an impression of most of the under clothing so some aspects of John’s costume look a little odd on their own. First to be made were his pale green silk jersey stockings and a covering to hide the join between the end of his porcelain legs and the start of the padded wires of the upper legs. 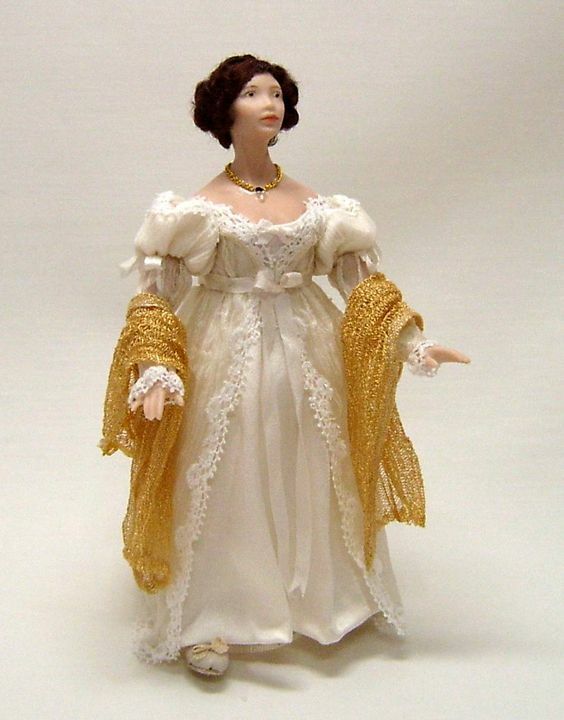 I feel this is absolutely necessary on most miniature dolls because people will ALWAYS (oh yes they do!) always turn the doll upside down to see what it has on underneath. I like everything to be nice and tidy underneath. 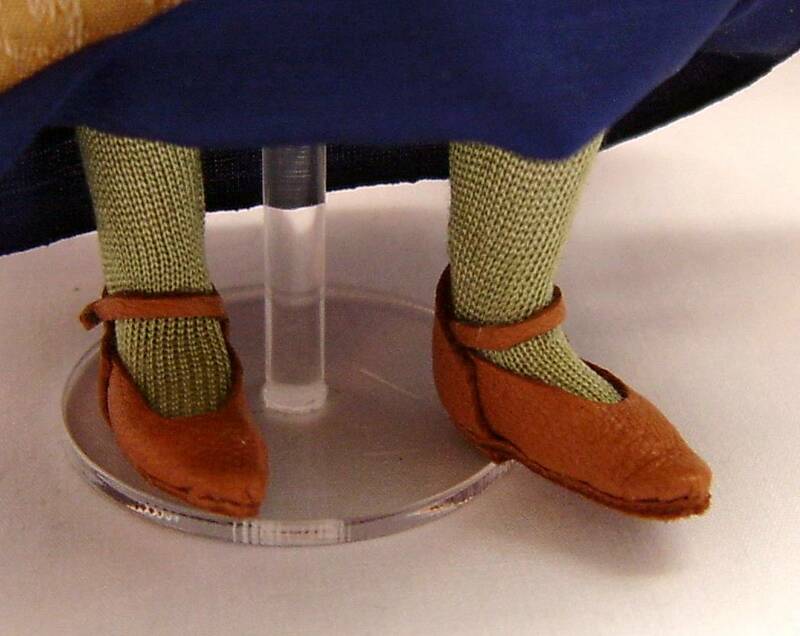 Next were his tan coloured leather pointed toe shoes, very fashionable at that time. Stockings, garters and a covering for the top of the legs for modesty and tidiness! Then I made his under-tunic which, in order to avoid as much bulk as possible was made in three separate parts: the skirt, the top of the neck area and the lower sleeves. I chose a very fine dark blue silk for this. False under garments in place. Once these were in place, his top tunic could be dressed onto him. For this I used a beautiful fine gold patterned silk jacquard and trimmed it with a very tiny burgundy ‘fairy lace’ braid. The sword was actually made from a curved sword that I straightened, painted the top and bound it in a leather ‘sheath’. Once the sword was secured in place I added a deep olive green leather belt with a fancy gold buckle. 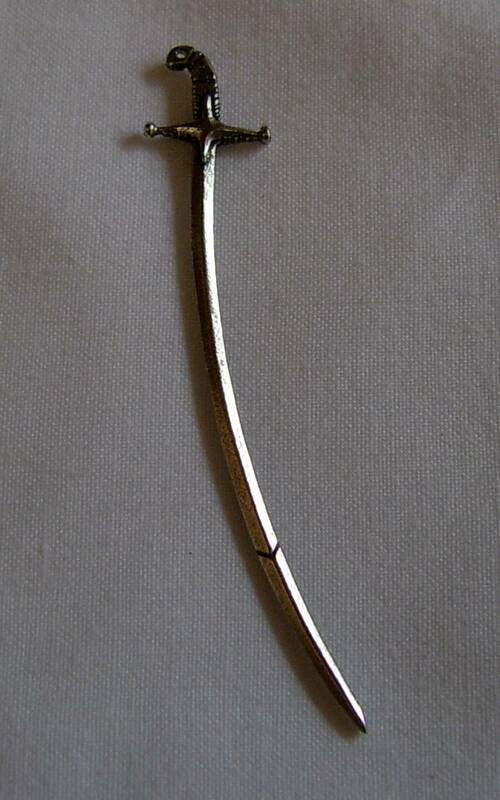 The sword was originally curved like this one. 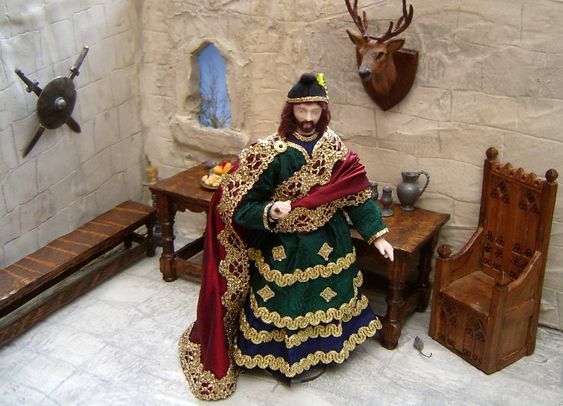 For John’s cloak I chose a deep red wine coloured silk lined with a finer silk of a similar colour. This was fixed to his shoulders with a tiny leather strap and two jewelled filigree ‘brooches’. His crown is simply a gold braid band with the addition of gold filigrees and coloured crystals. Just for fun I fixed a rolled up scroll of parchment paper tied with a red ribbon into his hand………this may or may not signify the Magna Carta……I’ll leave that up to you to decide! THE MAKING OF QUEEN ISABELLA. 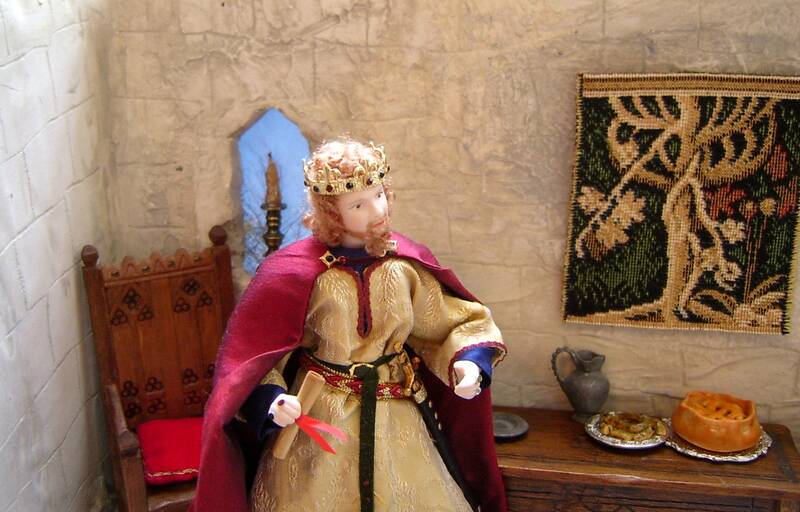 So once King John was finished, well I couldn’t possibly leave him on his own now, could I? Of course not, so history books (and the internet) were consulted to see who his wife was. This was quite a surprise because I didn’t know he was married twice. 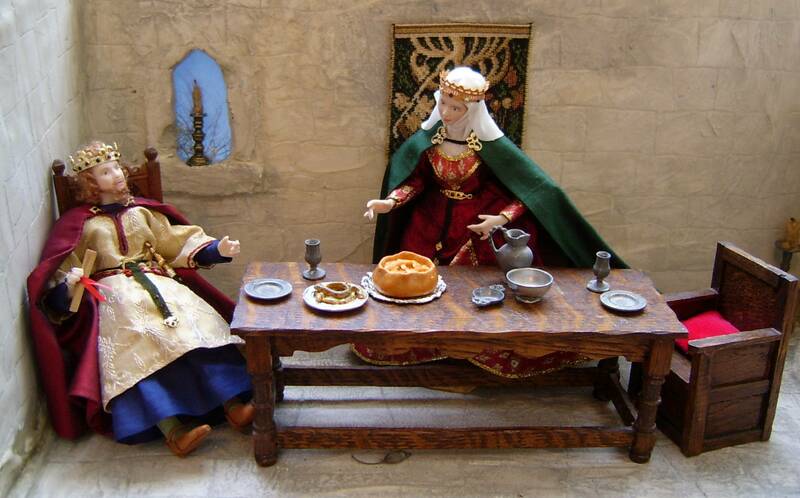 The first wife before he became King, was Isabella of Gloucester, but it seems that once he became King he decided that he preferred somebody else and had the marriage annulled on the grounds that she was too closely related to him. Strangely (said with tongue in cheek) he then married a much younger lady. He married another Isabella (handy!) a very young French maiden from Angouleme. This second wife was just 12 years old when they married in 1200 and apparently he was absolutely besotted with her and remained so until he died. Even more strange (but then maybe not!) was that the first Isabella remained living in her own apartments in the royal residence…..must have led to some rather awkward moments between the two women over the years! So my next job was to see what a young woman in her twenties might be wearing in 1215 and have another rummage in my fabric stash. As with her husband, I started with her silk stockings, some cotton drawers (yeah, yeah….I know they didn’t wear any then…. 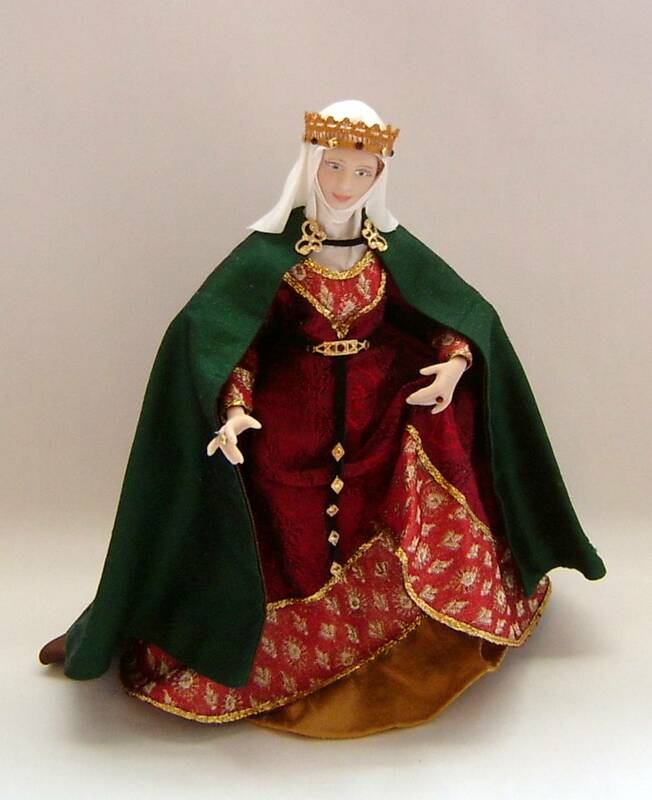 but read my previous blog post on Queen Anne Neville to see why) and some pointed toed slippers in fine leather. 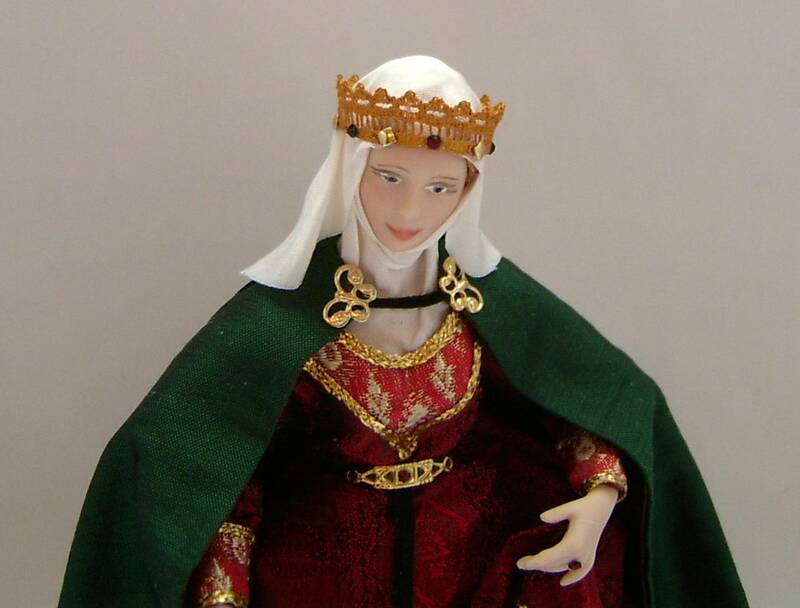 As with King John, only the skirt part of the under-gown is made, to avoid unnecessary bulk. I chose a gold silk for this. Isabella’s over-gown is made in a fine richly patterned deep red silk jacquard, trimmed with red and gold patterned silk brocade at the neck, cuffs and hem, edged with flat gold braid. Like john, she has a leather belt around her waist with a fancy gold filigree buckle and the end of the belt hanging down. Around her shoulders is a floor length trained cloak in deep green silk lined with brown silk lining. 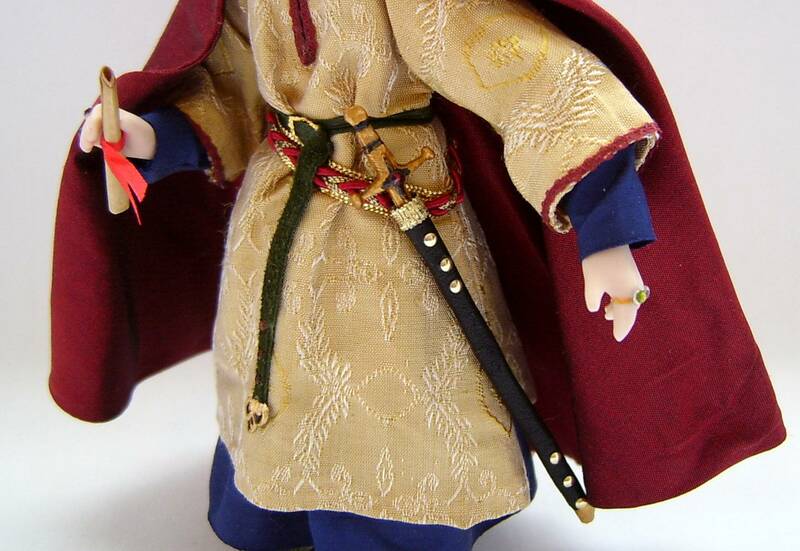 The cloak is fixed like John’s, with a tiny leather strap and two fancy gold filigree ‘brooches’. At this time, it was no longer as fashionable to have the hair on show as it had been back in the early 1200’s. By 1215 the hair was covered, along with the neck with a piece of fabric known as a wimple. On top of this was a circular veil held in place with either a band, or in the case of Queen Isabella, a crown. 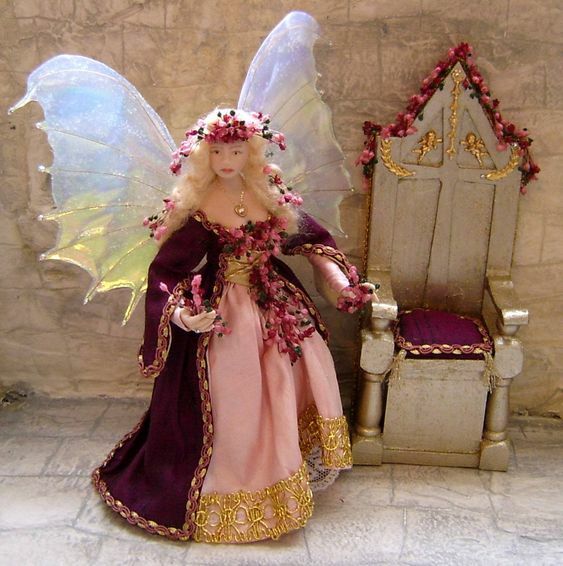 My Isabella’s crown is made from lace painted with metallic gold paint and decorated with tiny crystals. Wimple, veil and crown detail. 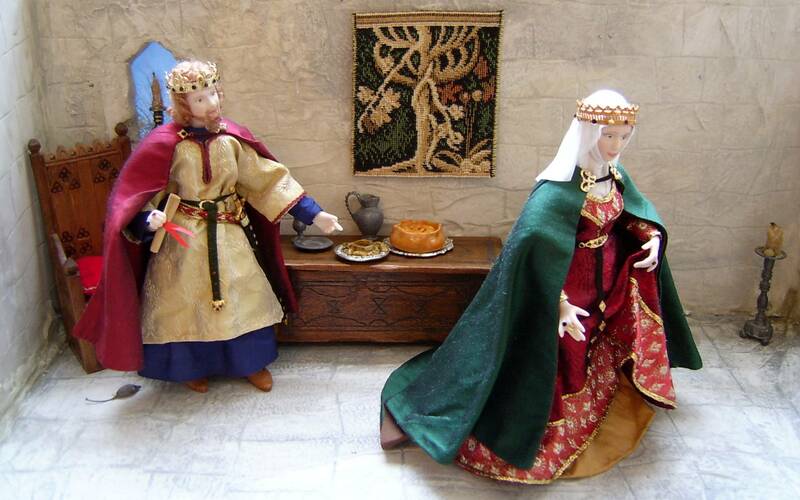 Below are some pictures of my King John and Queen Isabella taken in a suitable room box scene along with some miniature food made especially for them by Mary Thornton Medieval Morsels. 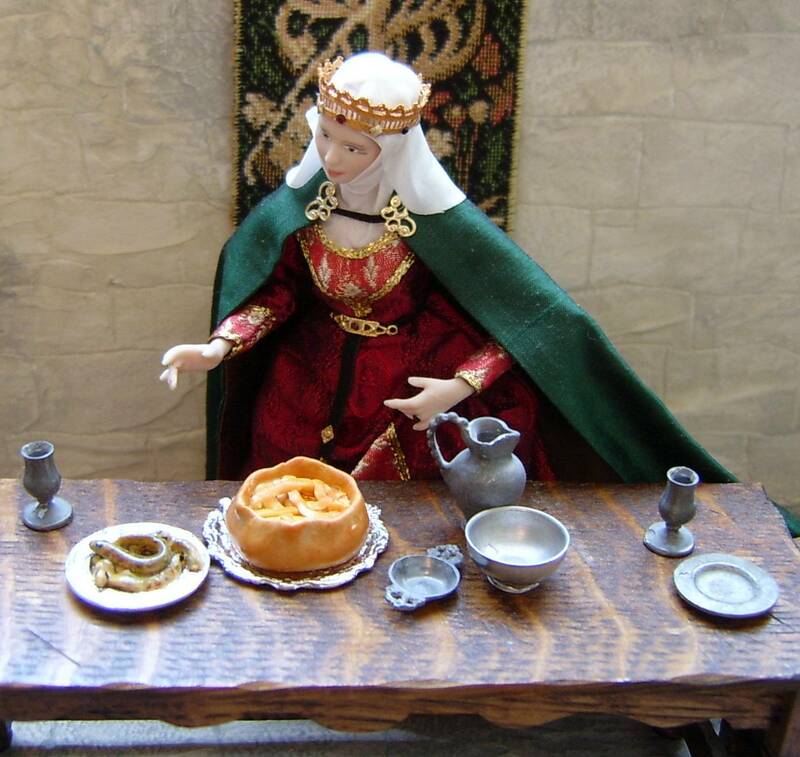 Mary makes the most accurate miniature food I have seen and she made a dish of lampreys and a lamprey pie (King John’s favourite food) for me. The miniature lampreys look wonderfully revolting (no offence meant to any lamprey lovers out there!). 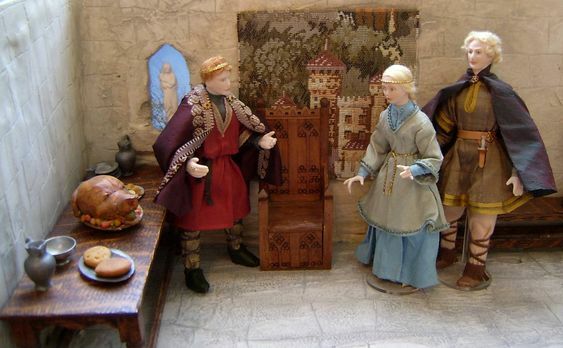 King John is calling for his wife Queen Isabella. But Isabella is not impressed and rushes out. 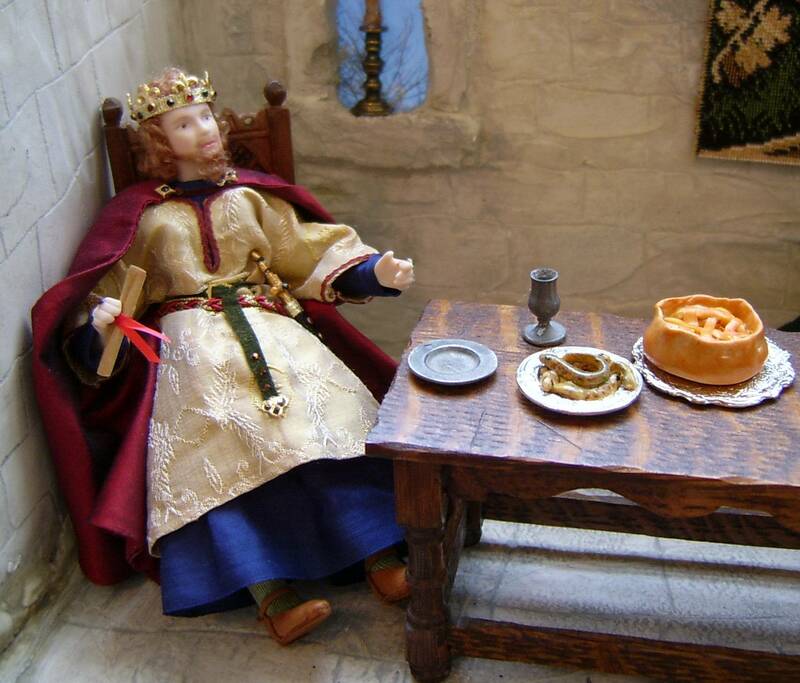 Later at dinner a relaxed King John is looking forward to his lampreys and tries to persuade Isabella to try some. 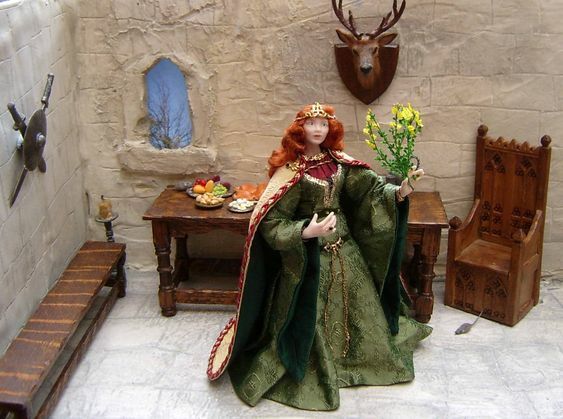 If you are in need of some miniature food for your dollshouse, it is worth taking a look at Mary’s work. 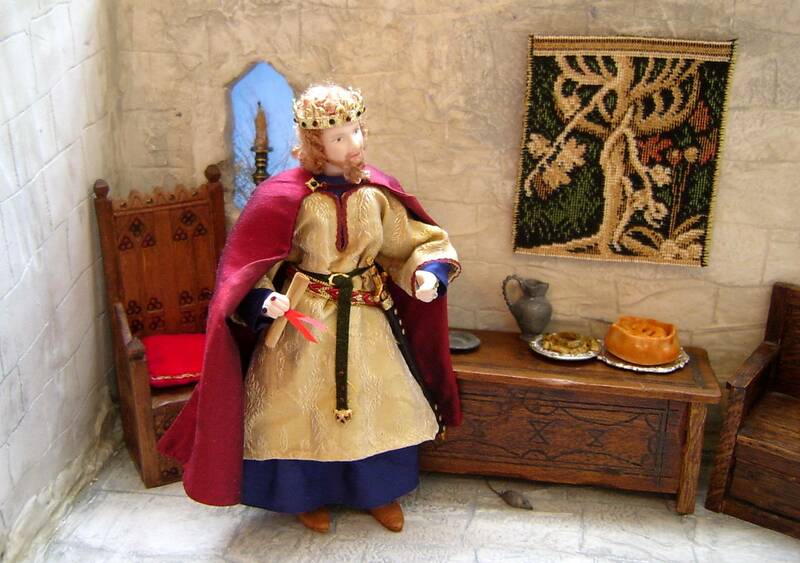 She also has a blog about King John and the lampreys that can be found here. 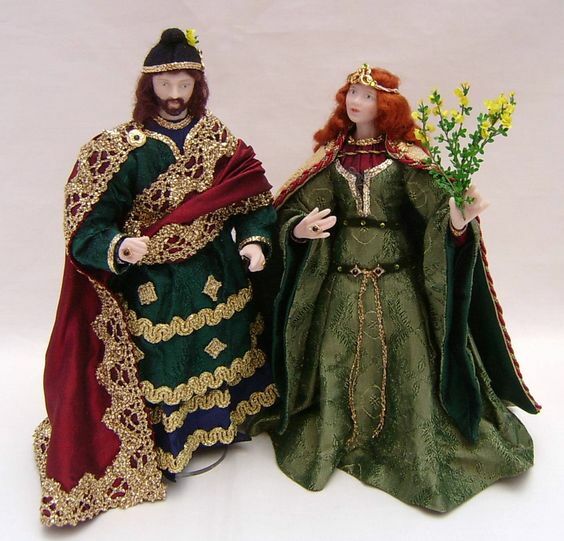 I hope you have enjoyed reading my blog about the making of my King John and Queen Isabella miniature dolls. Both dolls are for sale. Please contact me if you are interested in purchasing them.